The DuraMAC™ Booster System was built with one simple goal in mind – to be the World's Most Versatile Booster System. It is the first booster pump of its kind to be designed for virtually all boosting applications. The residential and light commercial / irrigation boosters can be run in three different modes, based on your boosting needs. In Pressure Mode, the pump starts with pressure drop and stops on low flow. In Flow Mode, the pump starts and stops by sensing flow. In Conservation Mode, the pump only operates during a peak demand, such as when multiple showers, bathtubs, or irrigation systems are running. 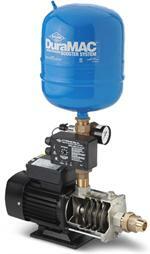 The commercial booster may be run in Pressure Mode, where the pump starts with pressure drop and stops on low flow. It may also be run in a conventional Pressure Switch Mode, where the pump starts and stops on pressure. 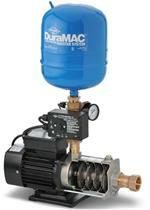 A single-speed, totally enclosed fan-cooled motor drives the DuraMAC™ booster pump with single phase power. It is controlled with one dial and tells you it is working properly by illuminating a single status light. The settings and readouts are simple and straight forward. A pressure transducer constantly monitors system pressure and alerts the pump control to start the pump as water in the system is used. The pump then stays on, boosting the system pressure until the need for water is no longer present, indicated by low flow. Electronic components are completely separated from piping and water ways for added safety and ease of field repair. 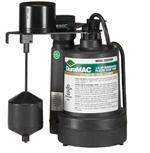 The DuraMAC™ is built from scratch with one purpose in mind – boosting water pressure. Each component of the system is specifically designed to work together, as one harmonious unit. The result is a complete package backed by an industry leading limited warranty.